Ethakka Tholi Thoran is a yummy stir fry you wont believe. 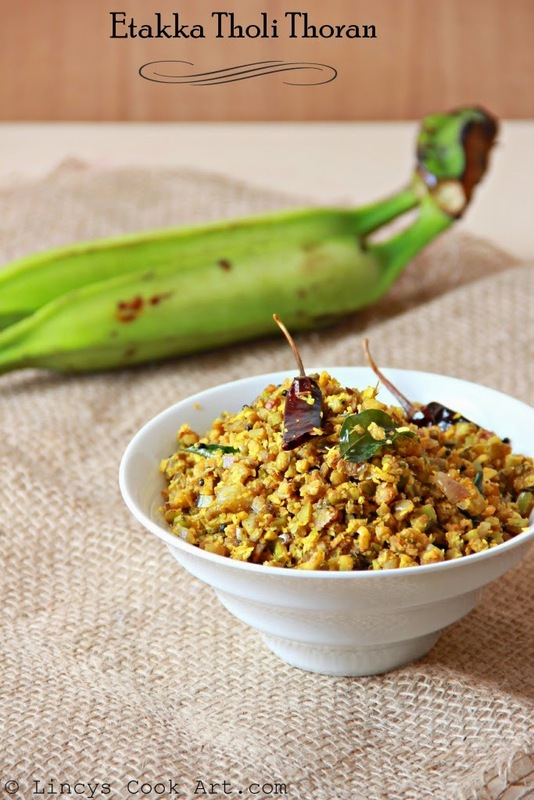 After making Banana Chips and Sarkara Varatti (Sweet Banana Chips) heaps of plantain peel will be left. Out of this we can make yummy stir fry instead of throughout that into waste. It taste same as that of thoran made out of small banana varieties. If you do not inform to your family members they wont recognize that it as a banana peel. This peel is rich in fibre so it is good for health too. You can eat as a side dish for rice paired with rasam or moru curry or even with simple curd it tastes divine. Peel the bananas and soak the peel inside the water till you use it to avoid browning. Take out from water and shake to remove the water and chop them very finely. Grind coconut, jeera, onion and garlic in to a coarse paste without adding water. Heat oil in a pan and splutter the mustard seeds then add the broken dried red chilli and curry leaves. Then add the onion and cook for thirty seconds till it becomes transparent. Add the chopped banana peel and roast for a minute. Sprinkle some salt and water; close with a lid and cook till the peel cooks soft to touch. Add turmeric and chilli powder and ground coconut mixture and mix well and cook for thirty seconds till the raw garlic smell leaves. Tried this thoran long back, such a delicious side dish.